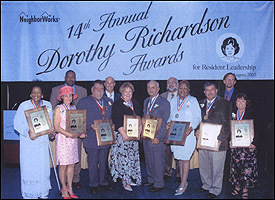 Former RDLN Board member Art Estrada was presented with a Dorothy Richardson by the national organization NeighborWorks in Washington, DC on August 22. The award honors Art's volunteer contributions as a board member of Homewise in Santa Fe, which "works to create affordable housing and helps first-time homeowners with the homebuying process." As part of the award, Homewise received a check for $5,000. 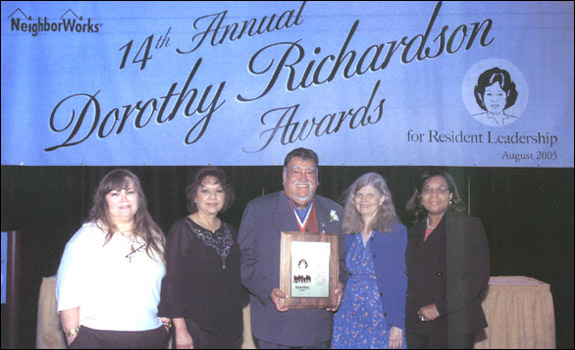 As reported in the Santa Fe New Mexican newspaper, "Estrada was a key player in the establishment of affordable housing in Santa Fe's Tierra Contenta subdivision, where he purchased a home and continues to be involved in leadership training and neighborhood issues." 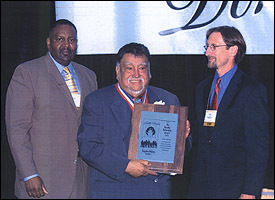 Art Estrada also recently received a President's Call to Service Award from the President's Council on Service and Civic Participation. Present to celebrate the presentation of Art Estrada's Dorothy Richardson award were (l to r) RDLN Leader Carol Jorgensen, head of tribal relations at EPA; Marianne, Art's sister; Art; RDLN President Starry Krueger; and RDLN Leader Emma Dixon, who presented a workshop on the Creation of Wealth for United for a Fair Economy at the Neighborworks conference.